My day begins at 8 with breakfast in the studio. I blend a shake of spinach, peaches, ginger, almonds and chia seeds in the Nutribullet and I’m ready to start the morning. First task today is sorting out the guest bedroom as a B&B guest has just departed and another one is due in tomorrow. This reminds me that I haven’t updated my Airbnb listing since I moved to this house in June, so I decide to do that too after I finish with the room. Of course loading all the new photos and re-writing the Airbnb listing takes a lot longer than I anticipated, and the main image doesn’t really work, but at least it’s done… for now. Next I catch up on emails, Facebook and twitter posts and make a few phone calls before going out. Quick dash to run some errands in Camberwell, including a visit to The Hill Bakery for my favourite multi-seed sourdough. Time for lunch! A sandwich, fruit and coffee in the studio. I can’t believe how dark it is outside… not great given my plans for the afternoon. The second half of the day is all about finishing work – I don’t want to be doing all this next week just before the Lambeth Open Weekend! 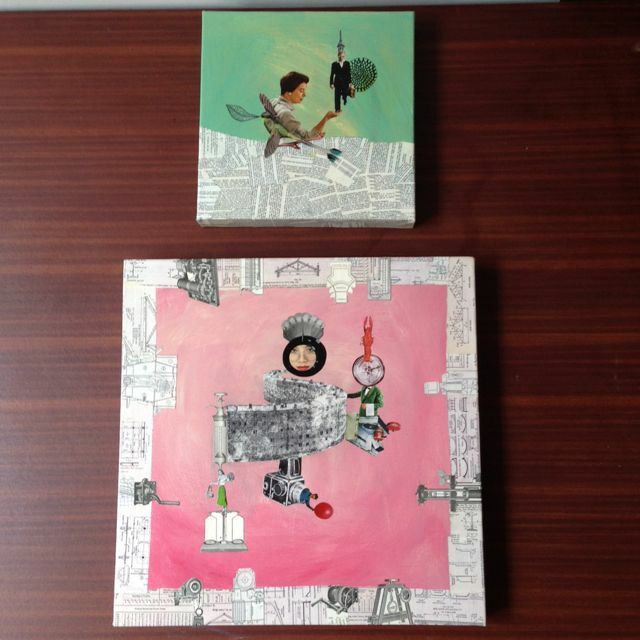 First I glaze a couple of collages. And even though I wasn’t supposed to start anything new, I can’t stop myself and prepare three more canvases – I’ve been buzzing with ideas for new collages on dark backgrounds for the last few days. Next, finish a good number of fairy brooches – this involves glazing the front, painting the back and gluing a pin to each one. All the lights are on in the studio by now: I always prefer to work by natural light but clearly this is not possible on this gloomy day. The dolls come out next. They are all at different stages: some still need decoupage, some just glazing and all have to be assembled. I glue crowns, bits of paper and foil, then sand and glaze bodies and arms. While I wait for the different parts to dry, I have a cup of tea and prepare some new decoupage samples for my next workshop. I use very thin papers for most of my decoupage, and these samples on pieces of card help people see how different papers look when applied on dark vs light backgrounds. This is particularly relevant when working on shoes, which is what I’m teaching this Saturday. I’ve realised I’m running out of time and energy: the dolls are not going to be finished today…and my intention to varnish this chair too may have been a touch over-ambitious. Back to the office: emails and a few updates on the workshops section of my website and I’m done. Time to close the workshop and go home now, which is my case means just a flight of stairs. 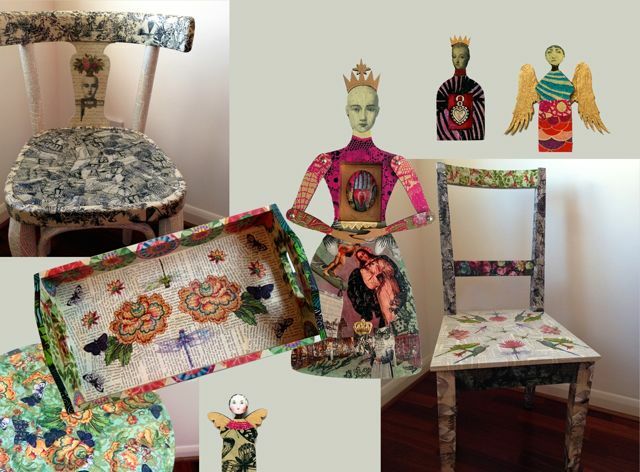 See more of Gabriela's stunning work (and find out more about her decoupage workshops) on her website. You can also follow Gabriela on Twitter, Instagram and Facebook. 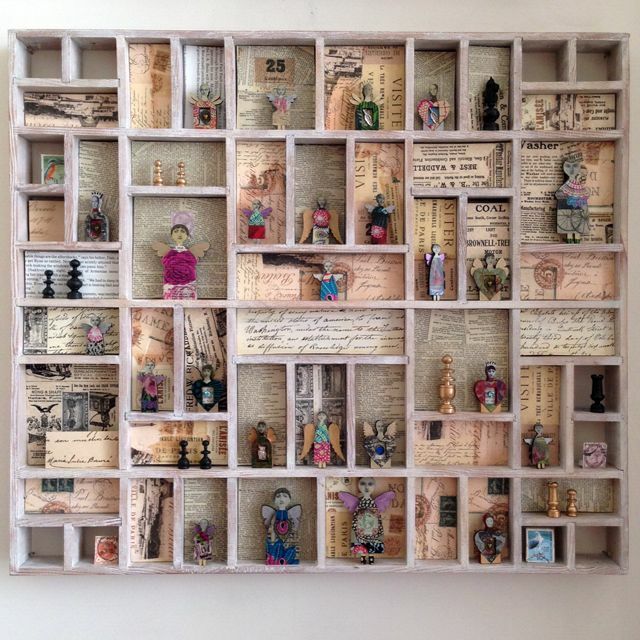 If you're in London make sure you go and visit Gabriela's studio during the Lambeth Open this weekend! Catch up with the other posts in the Day in the Life series here.